The great challenges of the 21st century, from urbanism and climate change to food scarcity and immigration, know no borders. This past May, Fordham took a big step toward embracing this new world, as 14 members of the faculty and administration traveled to Sophia University in Japan as part of the first Fordham Faculty Research Abroad program. The delegation, which was led by Fordham’s provost, the late Stephen M. Freedman, Ph.D., hailed from fields as varied as political science, economics, biological sciences, education, social service, and art history. The theme of the trip was comparative urban studies. George Hong, Ph.D., chief research officer and associate vice president for academic affairs, said the trip was the result of Fordham’s Continuous University Strategic Planning (CUSP) process, which the University began in 2015. In the CUSP process, four areas were given high priority: Interdisciplinary research, sponsored research, global research, and faculty-student research collaborations. This trip fulfilled all of those priorities by bringing Fordham researchers into contact with peers in Japan who are pursuing research on many topics within that field. It also established an exchange program for faculty and students between the two schools. Fordham faculty boarding a boat for a river cruise in Tokyo. One of those connections was between Garrett Broad, Ph.D., assistant professor of Communication and Media Studies and James Farrer, Ph.D., a professor of sociology and global studies at Sophia University. Farrer has been researching food entrepreneurship in Tokyo and the role that small vendors play in local economies, a topic of interest to Broad, who penned More Than Just Food: Food Justice and Community Change (University of California Press, 2016). “We’re talking about setting up a workshop here in New York at some point next year where we bring together a group of scholars who are exploring issues related to food, society, globalization and local food economies,” Broad said. Broad also took the opportunity to visit and interview scientists at a Tokyo organization that is experimenting with “cellular agriculture.” The technology, which Broad had already been researching for an upcoming project, involves growing meat in a laboratory, negating the need to slaughter animals. To help him overcome language and cultural barriers, he recruited Sophia University undergraduate students to accompany him. 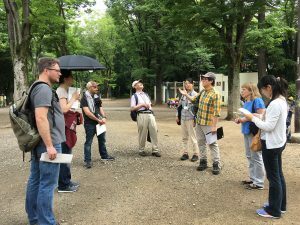 Fordham faculty tour a park in Tokyo. Annika Hinze, Ph.D., assistant professor of political science and director of Fordham’s urban studies program, came away from the trip deeply affected by potential collaborations. While one group from Fordham was given a tour related to sustainability and environmental issues, she attended a tour centered on social issues that was led by Nanako Inaba, a professor in Sophia’s department of global studies. Of particular interest to Hinze was a public park that had recently been partially sold to private interests, including Nike. A sizable homeless population still calls the park home, and Hinze interviewed one of them to get a sense of how his presence was actually a form of protest. “I’m a field researcher first and foremost, and in order to understand places, it’s vital to actually visit them and get to know them a little bit. The initial connections you make with people can be the jumping point for creating meaningful research partnerships,” she said. Connections such as these are crucial to solving challenges, Hong said. They’re also often a prerequisite for researchers who wants to get their projects funded by some external sources. “More and more American foundations are requiring global partnership as precondition for applications. If you don’t have an international partner, you are out,” he said. 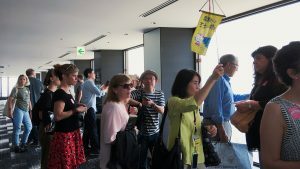 On that front, the trip was also a success, as Fordham faculty identified 27 researchers in Japan who are ready to collaborate on joint grant proposals, research projects, and research papers. Hong and his team also identified more than 40 funding opportunities to support these research projects. Several faculty members are working on joint proposals, he said, and one has already submitted one. He expects that there will be opportunities for Fordham students to assist in future studies as well. “They immediately picked up some ideas and learned from each other. It was the same subject, urban studies, but different disciplines, education, social service, the sciences, history, social sciences, humanities, natural science,” he said. In addition to prearranged meetings, there were serendipitous meetings at Sophia University as well. Takehiro Watanabe, Ph.D., an associate professor of anthropology at Sophia whose research touches on participatory community environmental processes, led the Fordham contingent on a tour of a river revitalization project and chaired a panel discussion that Broad participated in. “Afterward, he saw some things in my presentation that connected to some of the subjects that he’s interested in, such as participatory science and citizen science,” Broad said.